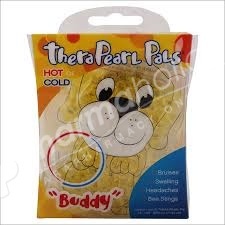 THERA°PEARL’s Pal Buddy a colorful, kid-sized animal friends calm and comfort as they heal. Kids love to play with the pearls so much, they won't fuss or fidget. When your children are hurt, you want to make it all better, NOW. For a fast, drug-free way to fix a boo-boo or soothe an insect sting try THERA°PEARL Pals. These colorful, kid-sized animal friends calm and comfort as they heal. Kids love to play with the pearls so much, they won’t fuss or fidget! Independent labs have verified that these non-toxic friends are free of heavy metals, lead, BPA and phthalates.